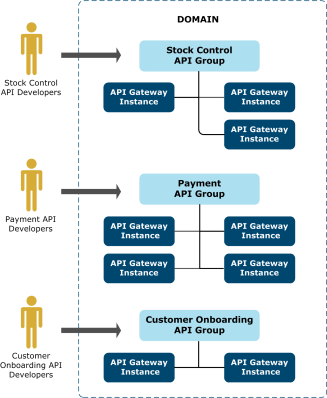 An API Gateway group consists of one or more API Gateway instances that are managed as a unit and run the same configuration to virtualize the same APIs and execute the same policies. API Gateway groups enable you to organize API Gateway instances by solution type and manage them as a single entity. API Gateways are deployed on the host machines. API Gateways are organized into groups of multiple API Gateways. A group must contain at least one API Gateway. All API Gateways in the group run the same configuration to virtualize the same APIs and execute the same policies. Partitioning of APIs and policies into different configurations should be performed by solution type. Groups span multiple host machines to provide availability, scalability, and load balancing. Note Multiple API Gateways can run on the same host machine. However, each API Gateway would be in a different group and run a different configuration. There is no benefit to running multiple API Gateways in the same group on a single host machine. An API Gateway domain is a distinct administrative entity that consists of multiple groups spanning multiple host machines. Domains are scoped on the boundaries of administrative control, which may be organizational or geographical. Multiple domains are possible based on different boundaries of administrative control. For example, you might have different domains for development and production environments, or different domains for each business unit. The Admin Node Manager in the domain is the central administration server for the entire domain, and is responsible for performing all management operations across the domain. In addition to managing the local API Gateways on its host, the Admin Node Manager communicates with the NMs to perform management and monitoring operations across the domain. Node Managers only communicate with the Admin Node Manager. 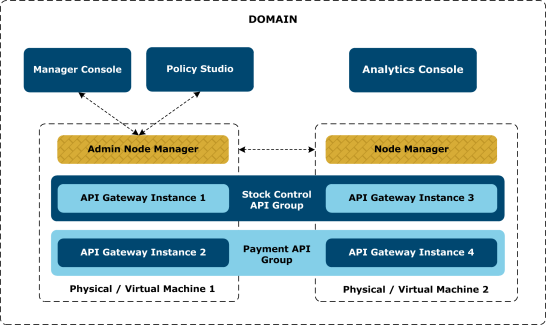 The API Gateway Manager and Policy Studio tools connect to the Admin Node Manager. Role-Based Access Control (RBAC) for administrative users is across the domain. For example, an API Gateway administrator can log into API Gateway Manager and manage all API Gateways and groups in the domain. There is a single metrics database in a domain. All API Gateways record metrics information in this single database, which can be used for monitoring in API Gateway Analytics, API Manager, or third-party tools. Note A single Admin Node Manager is deployed in the domain by default. However, you must configure at least two Admin Node Managers for high availability. For more details, see the API Gateway Administrator Guide. API Gateway groups enable you to partition your APIs and policies by solution type. 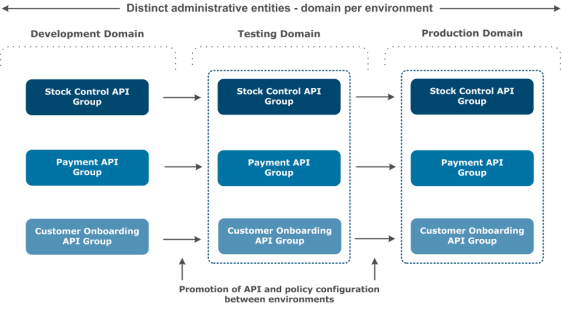 Partitioned APIs and policies associated with specific solutions are implemented in different API Gateway configurations, which are deployed to different groups and managed independently. 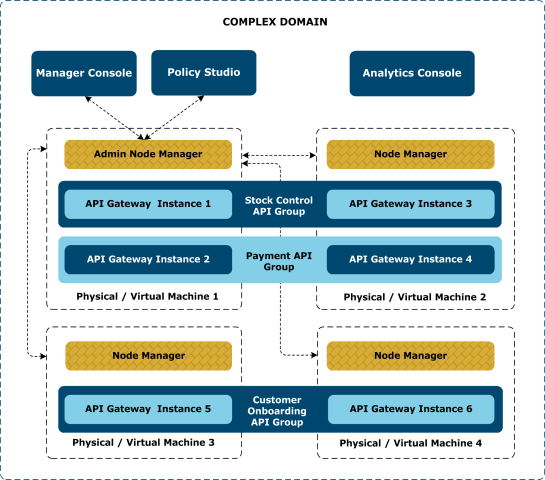 The API Gateway group and domain-based architecture enables virtualization by separating logical and physical architectures. The APIs and policies that are built and packaged into API Gateway configurations are decoupled from the physical architecture that they run, which provides flexibility and scalability of infrastructure. In this context, promotion refers to moving API Gateway configuration between environments and ensuring that environment-specific settings are properly configured. Deployment refers to the physical act of pushing configuration to an API Gateway instance (for example, using Policy Studio). For details on how to promote between environments, see the API Gateway DevOps Deployment Guide. Availability and horizontal scalability is achieved by deploying multiple API Gateways on multiple hosts and load balancing across them using a standard load balancer. The API Gateway imposes no special requirements on load balancers. Loads are balanced on a number of characteristics including the response time or system load. The execution of policies is stateless, and the route that a message takes has no bearing on its processing. No session data is created, so there is no need to replicate session state across API Gateways. If the policies use caches and counters, these should be configured to use the distributed cache shared by all API Gateways. For more details on caching, see the API Gateway Policy Developer Guide.